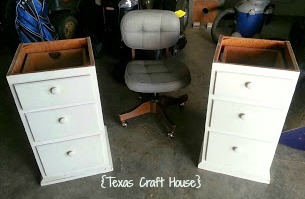 My husband and I went looking at a local thrift store for some night stands. 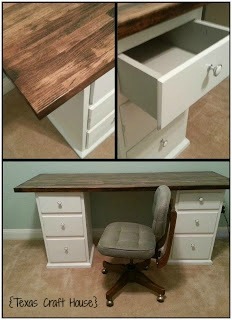 I saw several desk examples on Pinterest where you just add a wood top and turn them into a desk. While at the thrift store we found 2 old beat up night stands (they didn’t have a top or a backs) AND just happened upon a vintage-y office chair that was in great shape. All 3 pieces cost about $25 total. First I spent some time sanding the night stands. There were many scuffs and dents (which are hard to see from the picture above) and stains and uneven paint. These nightstands looked pretty bad. I wish I took some good up close pictures to show this. This process took some time but I knew it would be worth it in the end. 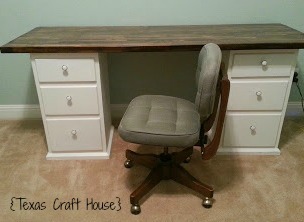 Then I repainted them white (I really wanted a white desk) using simple spray paint. Spray paint worked perfectly and helped speed up the process. When spray painting just use quick short strokes back and forth and you should come out pretty even. Make sure to stand a could inches away so you aren’t too close and the paint won’t drip. 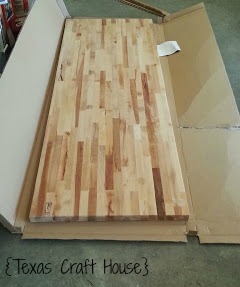 Then I stained it with two coats of wood stain and poly urethane for the last coat to protect it. I love the color it turned out! 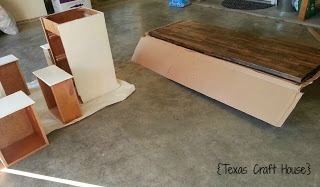 Here is a picture of the white paint on the nightstands and stain drying on the table top. Just be patient. 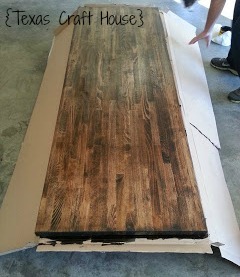 The sanding, painting, and staining can take some time but it is so worth it in the end. I didn’t take a picture of me painting the inside of the drawers but I just used a can of gray paint I found on the “oops” shelf at Home Depot. It was only $2.00. 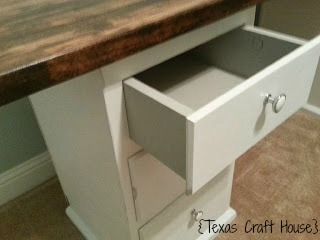 I love the way the gray looks when you open the drawers. 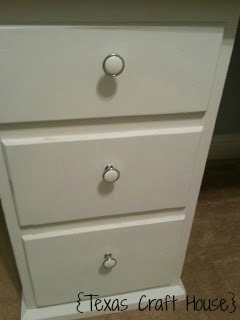 I also found the knobs at Home Depot for around $2.00 each. There is a little gray smudge on one of the drawers that I didn’t notice until after I took the pictures. I was able to fix it afterwards. I LOVE how the chair just matches perfectly!